Air Canada is one of the many Bombardier Q400 operators. Air Canada Bombardier Q400 turboprops are marketed under the "Air Canada Express" brand and are operated by two regional airlines for Air Canada Express. The two regional airlines operating the Q400 for Air Canada are Jazz Aviation LP and Sky Regional. Sky Regional Q400 aircraft are operated out of Billy Bishop Toronto City Airport / Toronto City Centre Airport (ICAO: CYTZ / IATA: YTZ). Air Canada Bombardier Q400 aircraft that operate out of the Toronto City Airport are flown by Sky Regional. Toronto City Airport is the closest airport to downtown Toronto and Air Canada is recognizing the convenience of the airport by using the Q400. Airlines are restricted to the size of the aircraft they can fly into the airport because the runway at the Toronto City Airport is short. The only other airline operating out of the airport is Porter Airlines and they were the first to use the Q400 from the airport. Air Canada then followed in their steps by getting the Q400 turboprop and using it to serve the airport. They are primary flying the Q400 from Toronto City to Montreal-Trudeau (IATA:CYUL) Sky Regional has a total of 5 Bombardier Q400 airplanes in their fleet. Above Air Canada Q400 photo by BriYYZ on Flickr & Wikimedia Commons, Modified by FlyRadius. Photo (only) released under a Creative Commons License. Air Canada's main hub is at the Toronto Pearson International Airport (ICAO: CYYZ, IATA: YYZ), where the rest of their Q400 operations reside with Jazz. Jazz operates all the other Q400 flights that are not flying to Toronto City Airport. Jazz Q400 aircraft primarily fly all over Canada including Toronto Pearson, however there are many flights that fly point to point from the other smaller Canadian cities like Calgary, Alberta to Victoria, British Columbia, Fort McMurray, Alberta, Saskatoon, Regina and more. The Air Canada Bombardier Q400 is, as noted, flying in western Canada. Air Canada seems to focus on using the Q400 on point to point routes in Canada, instead of hub flights or flights originating from their hub in Toronto. Jazz has 21 Q400s that are apart of their fleet. This gives Air Canada a total of 26 Q400s. On Bombardier's Q400 aircraft program order sheet it lists Jazz as having ordered 15 Q400s. This means that the rest of the aircraft are leased or have been purchased by Jazz Aviation / Air Canada on the secondary market. In the past Sky Regional and Jazz operated different seating configurations (70 seats / 74 seats), however they now both fly the Q400 with 74 total seats in a two by two configuration. There are no middle seats on the Bombardier Q400. Seat Pitch for this configuration is 31 inches and the width of the seats are 17 inches or 43 centimeters. The two Q400s have slightly different configurations as shown below in the seat maps. For Jazz, exit row seats are the 4 seats in the first row and are seats 1A, 1B, 2D and 2E. Column"C" is left off of the seat map for Jazz. Sky Regional's exit row is only in seats 2D and 2E. Over-wing seats include rows 10, 11, 12 and 13. There are no power ports or entertainment systems on-board the aircraft. The Q400 is a regional turboprop aircraft built by Bombardier in Toronto, Canada. The aircraft is known for its relatively good comfort in the cabin as it has improvements that make it quieter then other turboprops. It's propellers and noise suppression system make the cabin quieter then previous turboprops. The Q400 turboprop is also fast and can be faster then jet aircraft on short routes. It is powered by two Pratt & Whitney Canada PW150A turboprop engines that are mounted underneath the wings. To learn more about this aircraft visit the other pages here on the site. Bombardier DH4 Air Canada Express: "DH4" is the Q400s IATA code that is primarily used by airlines to identify the aircraft. Bombardier DH8D Air Canada Express: "DH8D" is the ICAO code for the airplane and is used by airlines, air traffic control and others. To learn more about this name visit the DH8D aircraft page. De Havilland Canada DHC-8-400 Air Canada Express: This is the model name for the turboprop. De Havilland was the previous division of Bombardier that built the aircraft. The De Havilland name is no longer used in marketing by Bombardier, so it is called the Air Canada Express Bombardier DHC-8-400. DHC-8-400 is the official model name for the turboprop that is used by aviation regulators to identify the aircraft. 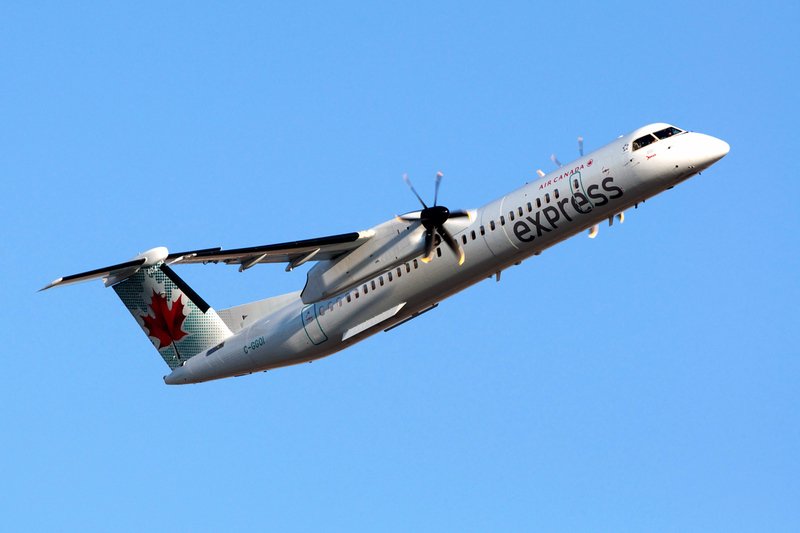 De Havilland Dash-8-400 Air Canada Express: the Dash-8-400 name is the name that was previously given to the aircraft by Bombardier. The Q400 was apart of the Dash-8 series program of turboprops. Bombardier then decided to change the name of those aircraft to the Q series turboprops and the Dash-8-400 became the Bombardier Q400. More on the Dash-8-400 name is found here.